Treat your lady like a princess with this spectacular beauty, as part of the LOVE collection by Vera Wang. 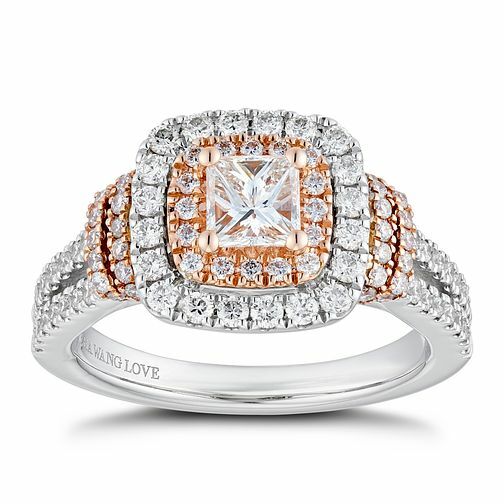 Combining classic with contemporary, this ring is crafted with both 18ct white and rose gold, with a perfect princess-cut diamond set surrounded by a dazzling double diamond halo. The sparkling stones are carried onto the shoulders, set to sparkle from head-to-toe, and captivatingly complimented by a hidden sapphire within the gallery. Capture hearts with this ring, boasting a total diamond weight of 1.18ct.